STC Equipment carries Zambello Riduttori Gearboxes, the largest manufacturer specializing in the production of gearboxes for Plastics, Pulp and Rubber machinery; For Single and Twin Screw Extruders Co and Counter Rotating and for Electric Injection Molding Machines. Design and flexibility, in line with the Customer’s specific requirements, which is certainly one of Zambello's strengths. An experienced staff of technicians and designers, working with the most sophisticated processing and development systems, are continually researching products that will best satisfy the requirements of the world market. The train design and manufacture are carried out in compliance with the the strict AGMA 2101 C95 (American Gear Manufacturers Associations) regulations. The gears are made of 18NiCrMo5 steel with helical gearing, profile ground to reach AGMA 12 (corresponds to DIN 4) quality, in order to ensure maximum quiet and effectiveness of use. 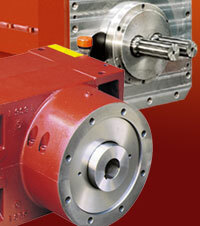 The technology of ZAMBELLO reduction gears is at the highest level worldwide.